The 100 µm scale bar applies to figs. 4 and 5; all other figures have their own scale bar. Figs. 1-6. Acrosphaera spinosa. Morphological variance includes difference in pore size and pore size distribution, length of spines, and sphericity of the shell. Fig. 5 shows the granular structure that appears as a result of dissolution; note that this is quite different from the layered structure visible in many non-colonial spurnellarians. Cp also with Pl. 4 fig. 3. Figs. 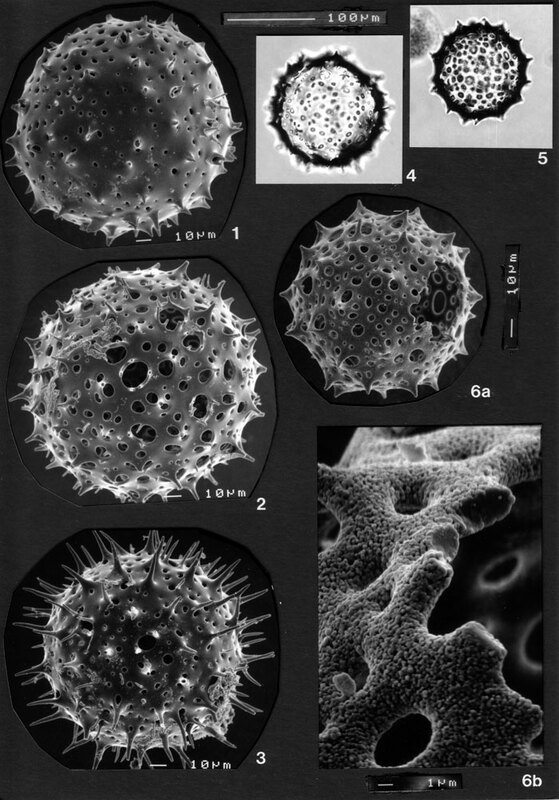 1, 3 and 4 are forma echinoides; fig. 2 is forma nassiterna. BSS 8B(VIII/875, 699, 706), 26B (Acrosphaera-prep. ), 26B(F) EF X48,3 and 28B(VIII/1013).